7.05 points at 20 votes (rank 340). You, the Underwear Man, just really want to go home unhurriedly from your boxing training . But obviously, everyone wants to beat you up today. This goes from people with bats over gorillas gone wild, dogs in need of love, bomb dropping midgets, 4 meter basket ball players, beer belly guys, karate fighters to crazy motorcyclists. You cannot put up with that and as you have just trained your square-shouldered, athletically built, brown(pink)-tanned body, you will show the inhabitants of Melbourne (that is where everything takes place). And you also have your special tricks up your sleeve. E.g. the "squeezing" of the ears, and the "spinning around in the air" of the opponent, etc. There is only one thing now: Punch your way through it! Horizontally scrolling beat-em-up of the mean but funny type with respectable graphics for one or two players consecutively. The 9 levels can be chosen individually at the beginning. The special moves (headbutt, turning the opponent's head, ramming the opponent into the ground, etc.) are different in each level. Enter name on the keyboard. Confirm with key Return . You only have approx. 10 seconds for that! 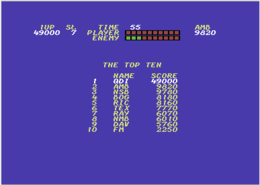 Unfortunately, the highscore list is not saved on disk!! You start with five lives. At the bar at the top of the screen you can see your energy supply. If an opponent comes near, a second energy bar will fade in. You can raise your energy by catching a heart that a dwarf in a trench coat throws at you. In the higher levels, however, it can happen that the dwarf throws a bomb instead of a heart. If you catch it, this will cost you a life. 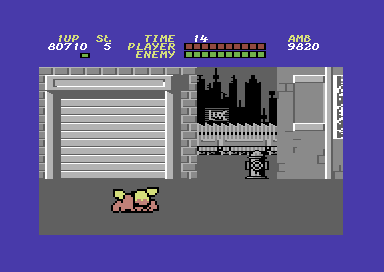 You disable bombs by standing in front of them and then pulling the joystick backwards and pressing the fire button. The leftover time at the end of a stage is converted to points. Do not assault small gals. You should avoid crazy motorbikers (jump). As a beginner, start at stage 1. H.T.W: "Although it goes also against blind people, grandmothers and small gals here, the bashing is simply funny and could, regardless of the taste, be seen as an answer to the big number of grim and very stern beat-em-up games. The music and FX fit the game well, the graphics are not very diversified, but good, especially the single figures are very well done. Just try and play it...". qdiace: "There is a painful bug on level 4: with fire+up, you twirl the enemy above your head but only the twirling decreases his / her energy, while throwing the enemy away, does not cause any injury." 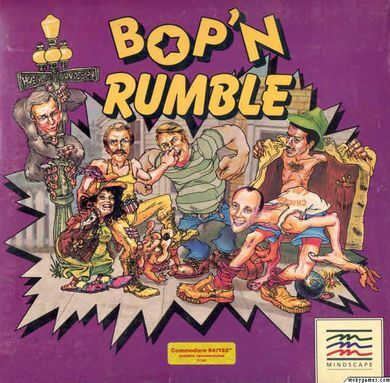 This game was also published under the names "Street Hassle", "Oma Schreck" and "Bad Street Brawler". This page was last modified on 26 January 2018, at 20:58.